NaNoWriMo. Also known as National Novel Writing Month, up until this last year, I was not aware of how awesome this was. Or what it was. I have always played the novel writing game with myself, but what makes NaNoWriMo so great is that it's a nation-wide event aimed at getting people away from the TV and in front of the keyboard. The goal? 50,000 words by midnight on November 30th. Write anything and everything you've ever wanted and get a chance to win NaNoWriMo within your region (you get a badge for reaching your word goal). It's fun, maybe a little bit hectic, but definitely worth the time and effort. It also goes to show that anybody anywhere can be a writer if you just sit down and let the words hop onto paper! How do you get to the 50,000 word goal by November 30th? Have any advice for new writers just beginning their journey into the storyworld? New to NaNoWriMo? No worries! 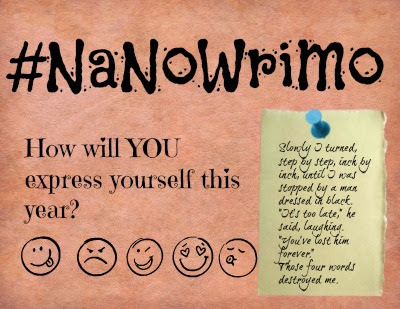 Check out NaNoWriMo's Official Website to get involved in the fictional fun!